1. In a medium Dutch oven, sauté the chorizo over medium-high heat until beginning to brown. Add the onion and peppers. Cook until soft, about 5 minutes. Stir in the garlic, cumin, chili flakes, paprika, and salt and cook for another minute. 2. Add the quinoa and stir until coated in the vegetable mixture. Toast the quinoa, stirring occasionally, for 3 minutes. Add the tomato paste, beans, and water or stock. 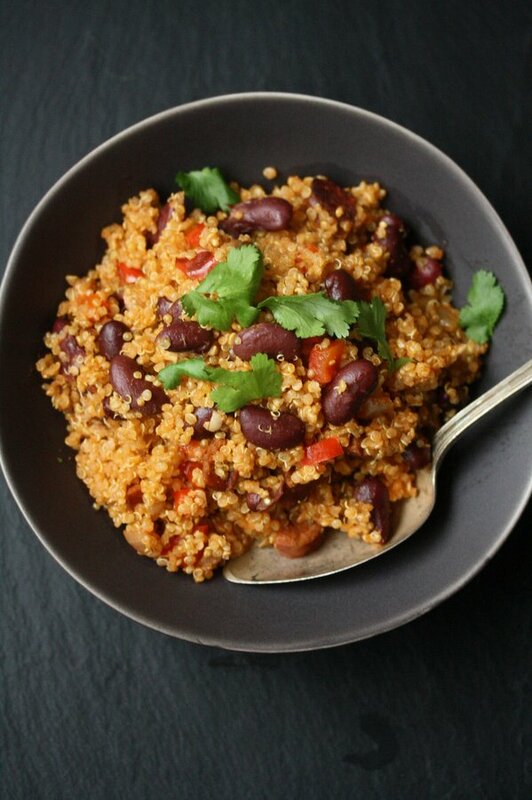 Bring to a boil, cover, and cook quinoa until the water has absorbed, 20 to 25 minutes. Stir once, replace the lid, and allow to steam off the heat for 10 minutes. 3. Taste for seasoning and serve warm or at room temperature.